Motoring-related jigsaw puzzles 1950s & 1960s. Homepage. 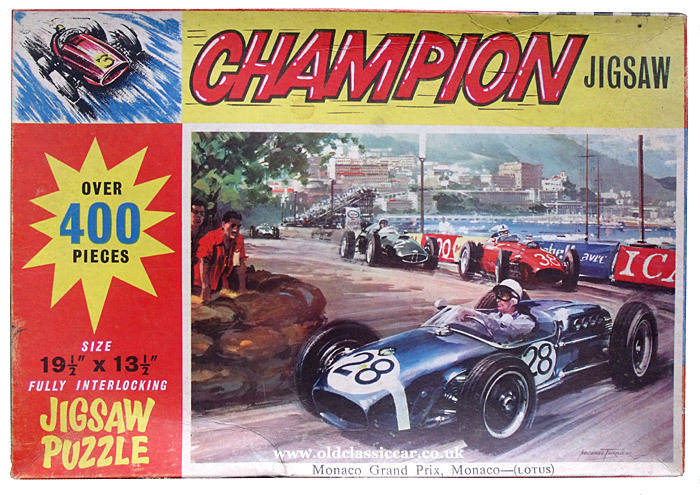 This page: A collection of jigsaw puzzles, all with motoring-related illustrations to them. 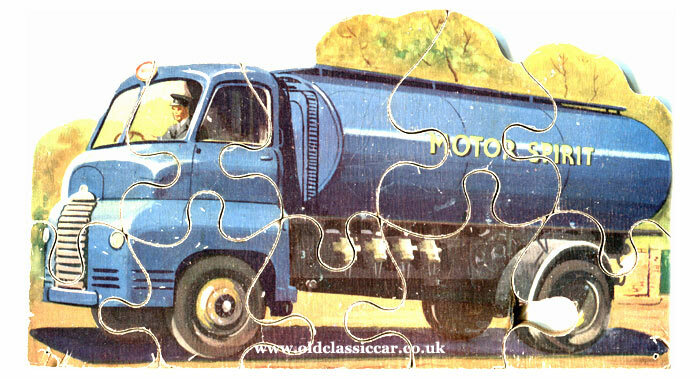 Old car, van and lorry jigsaw puzzles. This page in the car-related games and puzzles section, takes a look at a selection of old jigsaw puzzles. The examples shown here have been accumulated over a period of years, bought from eBay, car boot sales, and toy fairs. The two wooden jigsaws that begin the page were bought just a few days ago, at a boot fair, for very little. As far as collecting motoring-related games goes, buying jigsaw puzzles with a motoring theme to their illustrations can be a relatively affordable pastime. Here are a few suggestions for puzzles to look out for. 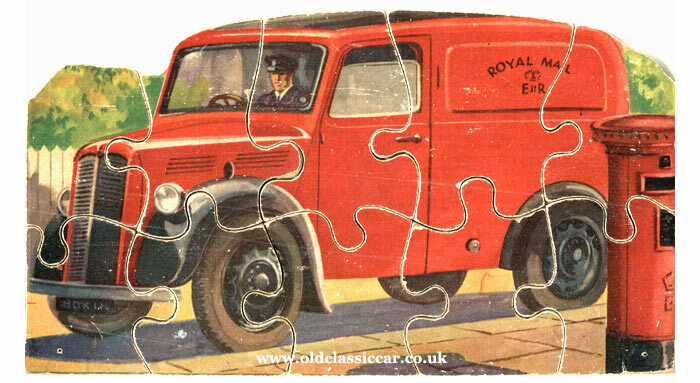 The puzzle portraying a mid-1950s Morris van, in the livery of the Royal Mail (one of Morris' largest customers at the time), was bought for the princely sum of two pounds. Think of classic Royal Mail Morris vans, and many will remember Morris Minors, the J-Types, and the slightly smaller Z vans, painted red and fitted with black rubber wings. Here though is the lesser-spotted Series Y 10cwt van, on postal delivery duties. The Y van was introduced, in limited numbers, in 1940 and continued in production until 1949. The puzzle isn't dated, but the post box bears the "E.R." initials, so must hail from the early/mid 1950s. As was common with earlier jigsaws, it's made from wood. Bedford S-type "Motor Spirit" tanker. Sadly neither of these two wooden puzzles bear a manufacturer's name. The second is of a magnificent Bedford S-type petrol tanker, or "Motor Spirit" tanker in the parlance of the day. The S-type was introduced in 1952, and continued in production for several years until it was replaced by the TK range, in 1959. The Car Race - a Victory Jig-Saw Puzzle. The Victory jig-saw puzzles were produced by G.J. Hayter & Co. Limited of Bournemouth, and their output was both sizeable and varied in their subject matter. Boxed, and also fashioned out of wood like all proper jigsaws, it too dates to the 1950s. 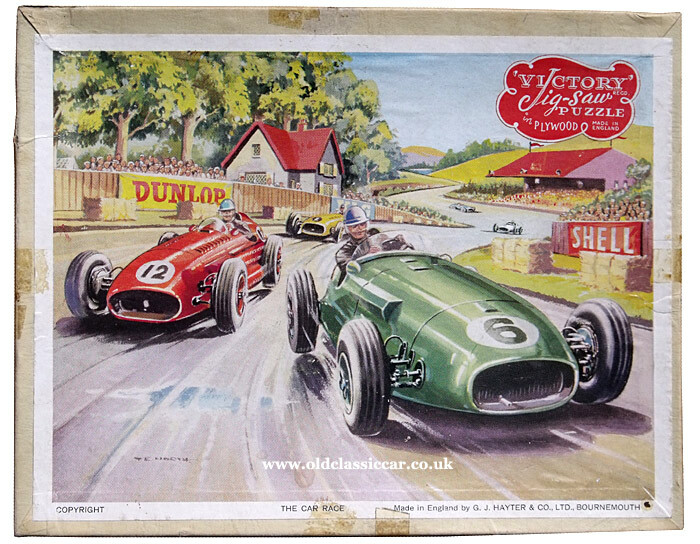 The top lid of the box portrays a motor racing scene, with a dashing driver in his British Racing Green car leading other machines entered by Italian, Belgian, German and French equipes. Excitement awaited any child receiving and completing this fine puzzle on his/her birthday, or Christmas morning. The finished puzzle measures 8" x 6". The box advises that it contains "around" 80 pieces, and is part of a series referred to as T.P.2. The recommended price was five shillings and threepence. The Good Companion Jig-Saw Puzzle. 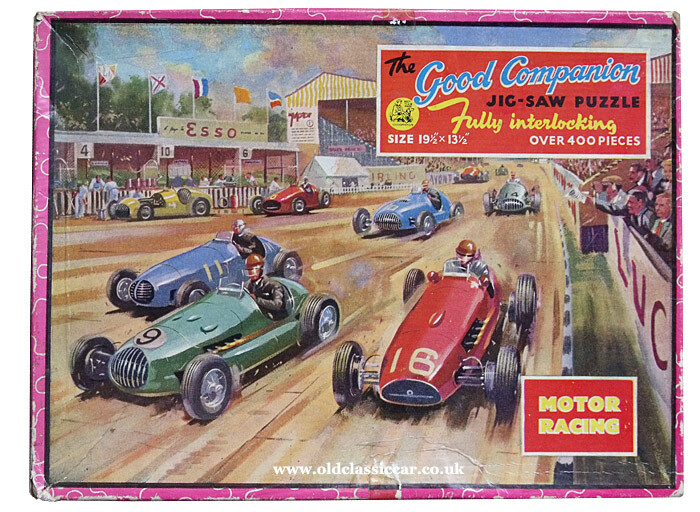 From a similar era is the following puzzle, again of a motor racing scene - one of several that were sold in the "Good Companion" series. Titled "Motor Racing", this puzzle has 400+ cardboard pieces, which - once correctly assembled - resulted in a puzzle measuring 19.5" by 13.5". Patriotically, once again the British team car is shown leading the pack, just a whisker ahead of rivals in Italian and French-entered racing cars. In a scene reminiscent of circuit meetings held throughout the 1950s, sponsor signs from the likes of Esso, The Motor, Girling, Avon and Lucas can be found. Keen spectators look on in awe as the brave competitors streak by, one particularly excited chap waves his event programme in encouragement. Over in the pits, a Ferrari prepares to pull away, while a car in the national racing colours of Belgium (yellow) sits forlornly, bonnet removed, while mechanics plot their next move. The Victory "Road Vehicle Puzzle". 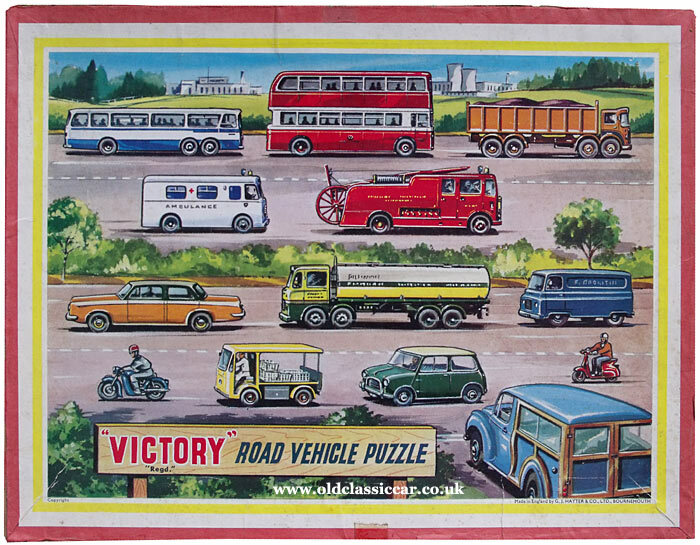 To the 1960s now, but still produced in wood, another example of a Victory jigsaw puzzle - titled "Road Vehicle Puzzle". Vehicles of many shapes and sizes are shown negotiating a dual lane carriageway. I did wonder if the scene was meant to loosely re-create one of the recently-opened stretches of motorway, but the junction where a Morris Minor Traveller patiently waits to join, is more A-road than motorway. While the milk float, and the chap on a scooter, look a little out of place on a high-speed stretch of road, the Mini Cooper, emergency service vehicles, and the two-tone Rolls-Royce Silver Shadow, fit right in. My example sits within a slightly tatty box. Again "about" 80 pieces are contained within it, according to a label on the box, plus twelve cut-out models should also be present (which I'm missing). Champion - Monaco Grand Prix (Lotus). Still in the 1960s, and a return to the race track once more, with this "Champion" puzzle titled "Monaco Grand Prix, Monaco (Lotus)". Stirling Moss leads the 1960 race in car 28, a Lotus 18, ahead of a chasing (front-engined) Ferrari 246 Dino (Wolfgang Von Trips). Jo Bonnier in the BRM runs in third position. Here Moss raced for privateer entrant Rob Walker Racing. The artist in this case was Michael Turner. Other old jigsaws will be added here in future.